Michael P. Murphy, P.A., provides strong representation for traffic violations, business and commercial law, and motor vehicle accidents. Based in Rocky Mount, North Carolina, my law firm serves clients throughout Nash County, Edgecombe County, Wilson County and Halifax County. My traffic violations practice includes representation for reckless driving, speeding, driving while license revoked (DWLR), driving with no operators' license (NOL) and failure to stop for a stop sign/light. In these matters, I will advocate for the best possible outcome to your citation. Additionally, I can help with motor vehicle accident cases, including those that involve underinsured or uninsured motorists, trucks and motorcycles. If you have been in an auto wreck, I will meet with you to determine the extent of your injuries and negotiate on your behalf with the insurance companies. I also help with many aspects of business and commercial law, basically anything necessary to set up a business and keep it running. This includes the drafting and review of contracts, partnership agreements, sales agreements, business lease agreements and any other kind of documentation. In addition to ongoing business needs, I also assist with commercial collections, breach of contract or any other type of business litigation. With more than 20 years of legal experience as an attorney, I have a long-standing relationship in the community and have fostered several ongoing attorney-client relationships. I am committed to providing quality service and a high degree of personal attention to every one of my clients. 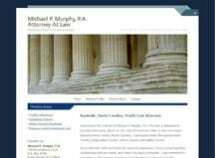 Contact Michael P. Murphy, P.A., today to talk to a lawyer about concerns regarding traffic violations, auto accidents or business and commercial law concerns. I provide free initial consultations.